The gift of tongues is usually, but certainly not always, the first outward sign of receiving the baptism in the Holy Spirit, an event that is so crucial that Jesus commanded His disciples not to begin their ministries until they had received the Holy Spirit (Luke 24:49). Those 12 men (with Mathias replacing Judas) as well as others in the upper room totaling 120, were baptized in the Spirit on the day of Pentecost (Acts 2:1-13) after praying for 10 days to receive it. This event not only signified the birth of their ministries but the Christian church as well. When they received, all began speaking in tongues, simultaneously. In practice, there are generally two kinds of tongues, known and unknown. Known tongues are earthly languages, either currently used or used in the past, such as the ones spoken at Pentecost. Unknown tongues is a language given direct from the throne room and every single one is as unique as the person it’s given to. The result is a direct pipeline to God through a language that He created just for you – a very powerful tool to say the least. By far the most common king of tongues is the unknown tongue, or heavenly language. 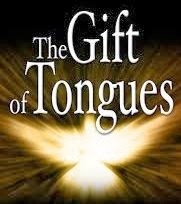 The gift of tongues is referred to as the heavenly language, praying in the Spirit, prayer language, Spiritual language, the gift of tongues, speaking by the Spirit of God or just speaking or praying in tongues. The following are 25 short teachings, with scriptural references (facts), that you should know about tongues – and the Holy Spirit. Take the time to go through these and read the correlating scriptures and I promise you're understanding of tongues and its use will be enhanced. **Since speaking in tongues is actually the Holy Spirit speaking through us, nothing can build this rapport faster - or more powerfully. **This is a prerequisite to any development in our Christian walk. Move in faith! **NOTE: The word ‘speaks’ here means publicly in the sense of prophesying through tongues. **This is why praying in tongues either in times of testing, trouble or when miracles are needed (i.e. healing) is important. **NOTE: The more you use tongues, the more proficient you become at it and the easier you can slide into it from speaking your earthly language when in prayer. Also, the more you use tongues, the larger your vocabulary becomes. **Sometimes we just need to get out of the way, relinquish and give it up to God and His will. **Note that praying in the spirit (tongues) can also be used as a defensive weapon.